This month we will cover the minutes from the Technology Working Group, and we will review the run-up to the 4.1 feature freeze at the end April (today). In the past month we have had an energetic run-up to the 4.1 feature freeze. Per our statistics on GitHub we have closed 97 issues (31 enhancements, 46 bugs) in April. As of April 30th, we are no longer accepting enhancements and will continue our work in closing the last 24 issues and polishing the release. Once the feature freeze is past and things settle down in Continuous Integration we will post links to engineering builds which we invite our members and community to test. Please put iRODS 4.1 through its paces, try new features and help to shake out any of the lingering bugs that lead to point releases. We will keep a close eye on GitHub for new bugs to fix, and pull requests are always welcome. Please note that there will be no supported upgrade path from the engineering builds, these packages are strictly for testing only. Cesar from the Consortium team is working on the new Cloud Browser. It is a reference user interface designed in concert with DICE to demonstrate key iRODS capabilities as well as some experimental features that may eventually migrate into the iRODS core. 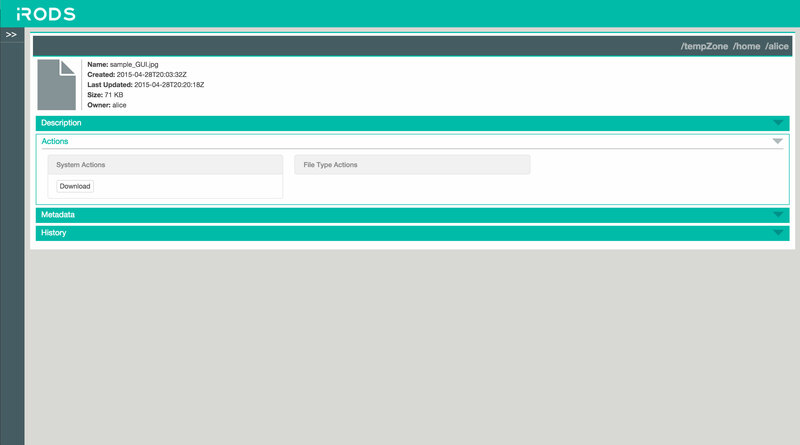 This month's development has been functional code representing the basic layout, login/logout, and file upload/download. The two screenshots below show multiselect and a details page about an iRODS Data Object.